The Zombies Are Falling! The Zombies are Falling! 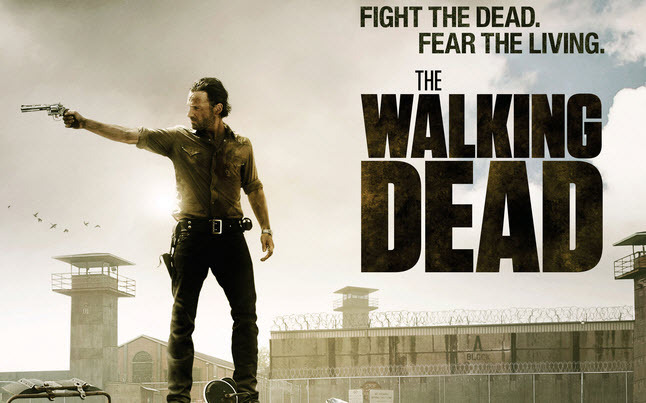 I just finished viewing the season 4 premiere of “The Walking Dead” and it was everything I expected and more. “The Walking Dead” is a story revolving around a group of survivors in a zombie filled world. This group includes retired sheriff Rick Grimes, played amazing well by Andrew Lincoln, group daredevil Glen Rhee, played by Steven Yeun, group badass Daryl Dixon, played by Norman Reedus, the tempermental son Carl Grimes, played by Chandler Riggs, the group doctor and sage Hershel Greene, plyaed by Scott Wilson, alternate group badass Carol Peletier, played by Melissa McBride, and awesome Samurai swinging lady Michonne, played by Danai Gurira. Now there are a ton more people included in this great cast of characters, in season 4, due to the fact that this group now occupies a prison and can support a larger group of people. Season 3 left the viewers unaware as to the future of this camp, would they move into the town that the Governor, played by David Morrisey, had established, would they keep the prison while keeping the survivors of the Governor’s town out, or would they accept the newbies in. Viewers were also unsure as to the current status of Rick’s psyche as he is a man who is struggling and struggling. Well season 4 left few stones unturned in that it answered a lot of questions. Now, if you haven’t seen the episode, please don’t read on. Viewers find out that the prison is a lot bigger, that a council has been established, that they now have crops and livestock, and that Rick is still struggling. I rather enjoyed this “catch-up” if you will. I like shows that have a time-lapse which allows for the viewer to play detective and figure out what has occurred in the time-lapse while also allowing the creators to show what occurred in later episodes, if they feel the need. Viewers find out that Daryl and Carol are becoming a bit closer, that the “group” has accepted more people into their group and that stabbing zombies in the face is a daily occurrence and a chore really. I liked this episode because it included all the things I love about “The Walking Dead”, zombie death, drama, and intrigue. The zombie deaths were great in this episode and utterly unique in that I have never before seen zombies fall from the ceiling. It was terrifying and I believe that this could make a good haunted house feature. These deaths were also as gory as ever, displaying heads being stomped on as well as zombies being disemboweled. All awesome. The drama was great in which Rick encounters the survivor who wants to feed her husband a nearly alive boar and then Rick. I liked the close-ups in this scene I also really enjoyed Andrew Lincoln’s acting. I liked that all of this death has had a profound effect upon him, as it should, because, this show would not be realistic if it didn’t include that at least. The intrigue in this show was the death at the end. What a cliffhanger! How did this kid turn and is it possible? Was he sick, then died, and then became a zombie? What happened? So in conclusion, this episode was typical of “The Walking Dead”. It included the essentials and has now made me look forward to the episodes I shall consume in the coming weeks.